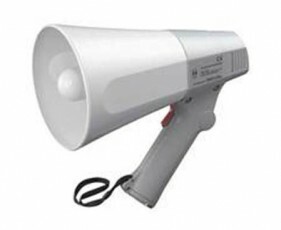 TOA offers an extensive range of portable power megaphones that provide optimal reinforcement for various applications in different environments such as schools, government organization facilities, factories and many others. All models incorporate anti-bacterial treatment to cope with multi-user environments. 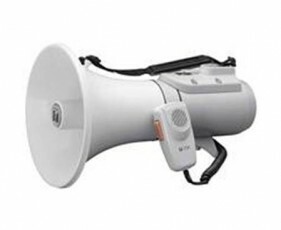 Featuring compact and stylish designs with powerful outputs, TOA megaphones also include splash-resistant types as well as high-performance shoulder types that provide a separate auxiliary input and even wireless microphone capability (ER-2930W). 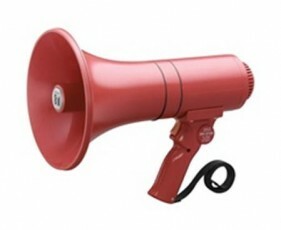 Other features such as siren (S) and whistle (W) are available on some models. The wide range of types makes it easier than ever for the user to select the ideal megaphone for his or her use. 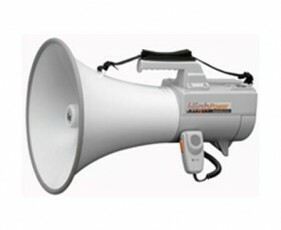 Sizes and weights range from powerful shoulder type megaphones with a maximum 45W output to light, compact models. The speaker features rugged polyimide (PI) materials for the diaphragms and neodymium magnets to achieve exceptional acoustic performance. Excellent battery life from AA, C or D batteries (depending on megaphone model) provides significantly longer performance. Fixed stand options are also available. 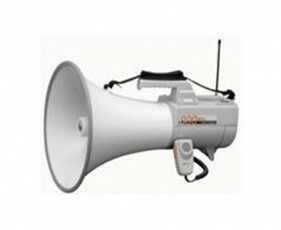 The ER2930W is a shoulder megaphone that can be mounted to the optional ST-16A speaker stand. 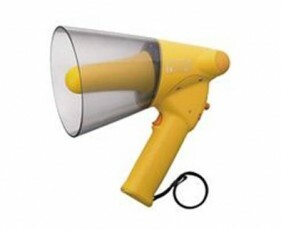 ER2230W Shoulder Megaphone with detachable handheld microphone, volume control, on/off switch, whistle, shoulder strap and carry handle. ER-2215 Shoulder Megaphone with detachable handheld microphone with volume control and on/off switch. 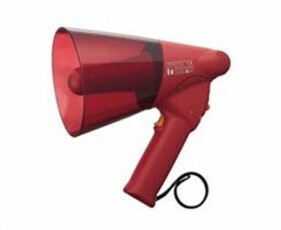 ER1215 Hand-held megaphone with built-in microphone, volume control, on/off switch and siren. ER1215 Hand-held megaphone with built-in microphone, volume control and on/off switch. The ER1206S is a compact splash-proof megaphone rated at 6W output featuring a water-jet-resistant design and siren. 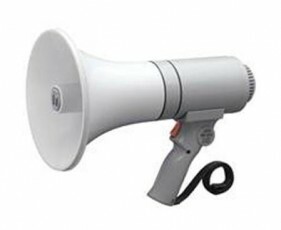 The ER1206W is a compact splash-proof megaphone rated at 6W output featuring a water-jet-resistant design and whistle.